At Adkins, our results-oriented engineers look forward to each new project and the challenges it brings. We incorporate our client’s needs into safe, code-compliant, and cost effective designs by taking the time to listen and understand. We combine this knowledge with fundamental structural engineering principals, our experience, and cutting edge technology, to develop the best design for each individual project. Adkins performed the architectural, structural and civil design of a new subdivision consisting of multifamily condominiums and single family townhomes. The project encompassed a total of 4.96 newly developed acres, 73,000 square feet of condominium indoor & outdoor living space, and 42,000 square feet of indoor & outdoor townhouse living space. The single family townhomes were designed using three unique layouts, and the condominiums were designed using two unique layouts. The civil design services included the design of ADA compliant flowing sidewalks, new sewer and water supply, and site gradation plan. Working with the City of Medford, Adkins was able to deliver a design that reduced the building costs while maximizing the number of buildings and aesthetic appeal. Adkins was the Engineer of Record for the Klamath Tribes’ $2.4 million, 7,500 square foot early childhood development center. We were responsible for performing a conceptual design and final design as well as completing all construction and bid documents. Adkins also managed the bidding process and performed construction administration, inspection, testing, project closeout, and a one-year warranty inspection. Adkins provided a full suite of engineering and support services for Aspen Dentals Klamath Falls location including: topographic/site survey, site planning, civil engineering, structural engineering, construction staking, construction observation/structural special inspections inspections, and construction materials testing. 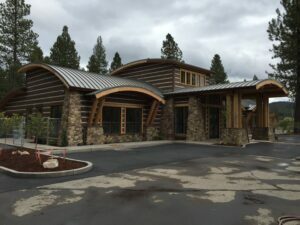 Adkins served as the Design Professional in Responsible Charge and as the Engineer of Record for the attractive new 5,000 square foot West Ridge Animal Hospital in Klamath Falls. This project was a complete remodel and 2,000 square foot addition to an existing 3,000 square foot building. We began the project with a conceptual design and also performed the final design, construction documents, inspection, and testing. The Klamath Tribes recently constructed a new $2.8 million assembly area that can accommodate 300 people and is appointed with a full commercial kitchen. This aesthetically pleasing structure features an energy efficient design using non-traditional energy efficient materials and assemblies such as an insulated concrete form foundation and structural insulated panel (SIP) walls. Adkins was the Design Professional in Responsible Charge and Engineer of Record responsible for the conceptual design, design, and construction documents. We also managed the bidding process and performed construction administration, inspection, testing, project closeout, and a one-year warranty inspection.